For new Blackjack players, it’s recommended to start with online Blackjack. The online casino software is a good guide and practice for players who are unsure of the complexities involved with playing the game. Online Blackjack games start by choosing the amount that you want to bet with on a hand. The available betting ranges all depend on the online casino that you’re playing at, but usually you can pick amounts of €1, €5, €25 and €100. After you finished betting, simply click the Deal button to receive your cards. Essential to mention is that Blackjack rules may vary from one online casino to the other and this could possibly complicate learning how to properly play Blackjack. The player should check for variations before playing, but in general, these are the basic Blackjack rules. Usually a 52-card deck is used for playing Blackjack, excluding the Jokers. In most cases, casinos make use of several decks mixed together, commonly referred to as a Shoe, to speed up the game and to reduce the frequency of reshuffling. 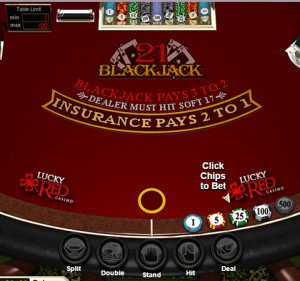 For the player, the ultimate goal of Blackjack is to beat the dealer’s hand without going over 21. Other players at the table are of no concern. Your hand competes only against the hand of the dealer. Aces are worth either 1 or 11, and whichever value makes a better hand will be used. The 10, Jack, Queen, and King are all valued at 10. The cards from 2 through 9 are valued at their face value. At the start of the game, every player at the table is dealt two cards. One of the dealer’s cards is hidden until the end, whilst the players’ cards are dealt face up. Hit means to ask for another card. Stand refers to holding your total and ending your turn. Bust means to go over 21. If you bust, the dealer wins regardless of his hand. “Blackjack” or “Natural 21” usually means you are dealt 21 in your first two cards (Ace + 10-valued card). You are also allowed to Split your two cards if you think that it will give you a better chance of winning. If you split a pair of Aces for example and then draw a 10-valued card on one of the Aces, this is not a Blackjack, but rather a total of 21. The dealer will hit until his cards’ total value is 17 or higher. A Double is similar to a Hit. However, doubling means that you will only get one more card AND the bet will be doubled. Split can be done when you have two of a kind and then the pair is split into two hands. In addition, by splitting you double the bet since each new hand is worth the original wager. A double or split is only allowed on the first move, or the first move of a hand created by a split. However, you cannot play on two aces after they are split (!). By doubling on a hand resulting from a split, your bet will be tripled or quadrupled. When your cards are dealt, you’ll be given the option to either Hit, Stand or Double Down and if you’re dealt a pair, you’ll also have the option to Split. Once you’ve chosen an action, the software will deal the cards to you and the dealer. When the hand is finished, you will either be paid money or have your bet taken, obviously depending on the outcome of the hand. You can then choose the Rebet option, which bets the exact same amount on the next hand or you can manually choose the next wager yourself.